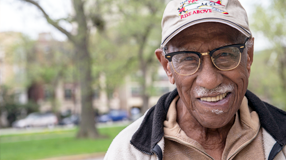 South Side activist and educator Timuel Black, AM'54, continues to inspire at age 95. A new hub for business innovation offers a fertile, collaborative environment for faculty, students, and local entrepreneurs. Joining forces with the Marine Biological Laboratory, the University formalizes its long-standing links to a venerable scientific destination. A Divinity School historian's study of medieval Europe becomes a wellspring of historical fiction. Yes, Ebola is scary. But the system is working. In the United States, health policy scholar Harold Pollack says, the disease is an "eminently containable public health threat that requires a calm, methodical response." Environmental microbiologist Jack Gilbert says studies in mice provide evidence that eating at unpredictable times alters the cycle of an individual's microbiome. Chicago Booth's Tobias Moskowitz argues that playing fields provide children a tailor-made context for learning basic concepts of math and economics. What if your humanitarian donations are making things worse? UChicago's Martha Nussbaum reviews Angus Deaton's book about the vast progress and persistent inequality in human health and wealth. Dean Sunil Kumar says Chicago Booth is in the business of "training future leaders as well as creating enduring knowledge." 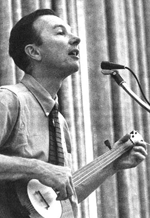 From a 1957 performance at Mandel Hall, Pete Seeger plays selections from Goofing-Off Suite. How well do you keep up with the page-turning pace? Festivities include the Athletics Hall of Fame induction ceremony, the third annual Block Party, and the UChicago vs. Washington University in St. Louis football game, which streams live October 25 on Maroon TV.